This exceptional, fine, large and impressive antique diamond brooch has been crafted in 18 ct yellow gold with a silver setting. The brooch has been modelled in the form of a swallow in flight. 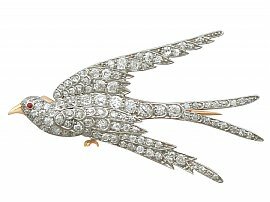 This large, platinum set antique swallow brooch is embellished with one hundred and four Old European round cut diamonds of various sizes. The eye of the swallow is represented with an old round cut, collet set ruby. The lower wing of this exceptional brooch is subtly articulated; this is a sign of fine quality. This large brooch secures to the reverse with a hinged pin and C style clasp. This impressive antique swallow brooch is an exceptional example of antique diamond jewellery. This brooch has been independently tested using state of the art technology (Niton XL2 Analyzer) and verified as 18 ct gold and platinum. This rare exceptional antique brooch is of the highest quality, set with very high colour graded old cut diamonds. The brooch a very good gauge of gold and is in excellent condition. Reflections in photography may detract from this fine example of jewellery/estate jewelry.